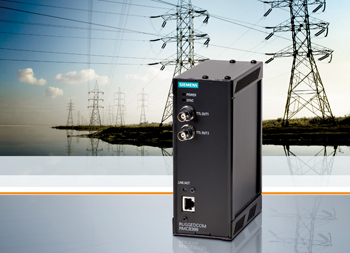 Siemens has expanded its portfolio of rugged network components with the Ruggedcom RMC8388 – a cost effective compact time converter designed to operate in harsh environments with widely varying climatic and environmental conditions. Withstanding extreme temperature from -40 up to +85 degrees Celsius, vibration and shock the device offers high reliability for electric power applications. By enabling cost effective time synchronisation Ruggedcom RMC8388 reduces both capital expenditures and maintenance costs. The Ruggedcom RMC8388 is available in multiple variants and can convert between the modern Precision Time Protocol IEEE 1588v2 and the legacy IRIG-B (Inter-range instrumentation group) time codes or PPS (pulse per second). The RMC8388 enables the usage of legacy IEDs (Intelligent Electronic Devices) within modern Ethernet networks without the need for maintaining a separate network for time synchronisation. The compact form factor makes the Ruggedcom RMC8388 ideal within modern Ethernet based networks while it uses only limited additional space in existing cabinets and defers capital expenditures by enabling cost effective time sync to existing non IEEE 1588 capable IEDs. Besides extending the service life of legacy IEDs, the new Ruggedcom RMC8388 also enables the connection of legacy time sources to a modern Ethernet based network to enable upgrading in phases without the need for upgrading everything at once. Ruggedcom RMC8388 also reduces high maintenance costs on legacy coax cabling by replacing them with standard Ethernet cabling for both communications and timing purposes, all the way to the switchyard cabinets.